Have you been using headings in your blog posts or articles? Headings are helpful to break down information for readers without overwhelming them with texts all over the page. Not only human readers, but also electronic devices and automated tools read your content and make use of headings to structure your posts or articles to present in a better way for human readers. Even search engines index your content effectively and structured manner if you use HTML header tags properly and your content will perform better in search results too. You love some SEO boost. Don't you? 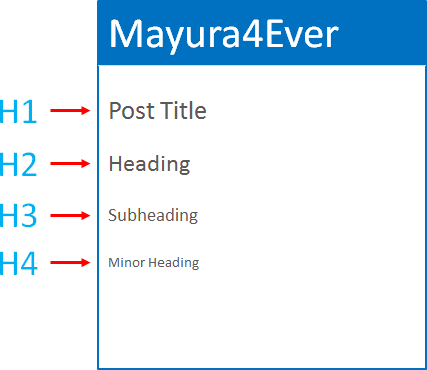 I assume you are familiar with header tags as we already discussed about the importance of using HTML header tags properly in posts or articles. 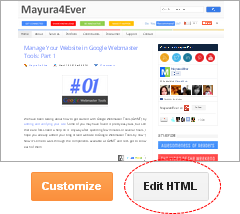 Now we gonna talk about something related to HTML header tags, but in Blogger platform. Were you aware that, by default, the post titles in Blogger are using H3 header tags? Yes, it is. Generally, Top level headings in a web page advised to use H1 HTML header tags. If we take a closer look at a single page in a blog on other popular blogging platforms, we can find the post title were tagged with H1 header tag. There's some obvious questions. How come H2 comes after H3? Shouldn't the post title header tag be H1? Wow... The structure is much better with H1 header tag for post title. In that scenario, post title acts as a top level heading and content headings falls under that. Isn't it the way that heading structure should be? Let's go and change it NOW. If the post title is using H1 header tag, it's structurally correct according to HTML standards. The more structural, it's more optimized for search engines too. As you are having H3 header tags for post titles, it's probably affecting on search results negatively? Not at all. You are missing the whole picture. You were gazing at the part of your blog. If you need your blog to be more optimized and technically correct according to HTML standards, you need to look at the whole blog structure and how headings were used. Yeah, your blog title and date header is defined as headings too. They are using H1 and H2 header tags. 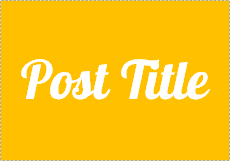 Still thinking about changing post title header tag to H1? However, Blogger is using structured data tags / properties in template source code to define headings more descriptively. Therefore even you change the header tags accessing your template, it will be safe for some extent. 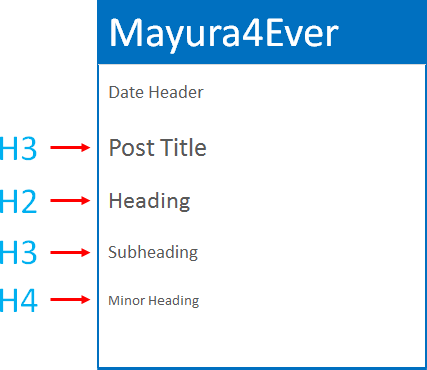 Eventhough it is safe with structured data properties defined, if you don't know what you are dealing with or not familiar with heading structure in your blog, don't try to tweak headings just because it says "Post titles should be tagged with H1 for better SEO". It depends on your blog structure. If you don't know about it, it's best the way it is. 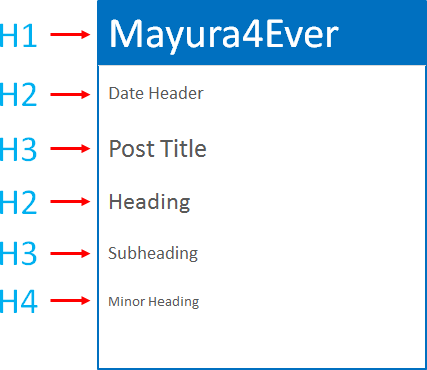 Very awesome tutorial Mayura! Gladly passing it along! Even though I am not on blogger, I can easily see how useful this information would be for others. Thanks for showing us step by step, I'm sure every Blogger user out there will thank you for it :)! Thanks for another great tutorial. I wonder how long does it take you to research all these information and come up with those great posts. Thanks Mayura for sharing this great information and I envy those bloggers using the Blogger Platform because they have a great teacher and resource here. I hope you have a great weekend! such a nice tutorial thanks for sharing it! although it looks quite complicated to me, actually that's why I always prefer the content management system of Wordpress, it is the most efficient combined with the Thesis framework which has got really cool mobile layouts as well. Awesome article Mayura. You have dealt everything very accurately. Keep posting such stuffs on regular basis. You are doing an exceptional work. Nice blog. Much impressed. I use H1 post title header tag for both other pages and home page. Does it sound any problem Mayura? Well, the best practice is having one H1 tag per page. Especially for post pages. Even if it's home page, having multiple H1 tags is not recommended Sebin. I mean, if you wanna follow HTML standards. Even search engines follow HTML standards mate. So, unless you are using customized template, having the default heading structure is optimal and won't hurt in ranking mate. If you made changes to your blog template and removed / changed existing HTML header tags, think about your heading structure again and apply them wisely. Successfully changed Mayura :) Million thanks for your advice!